Limited opportunities exist for qualified instructors to train on the job with Richard. 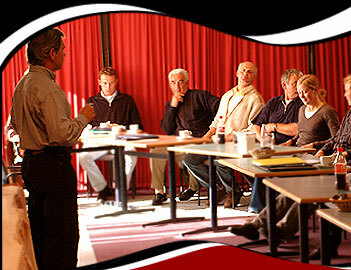 Instructor Training Clinics are structured to meet the needs of the group. From one day master class format to 4 day intensive hands on training. Specialized instructor training clinics offer an opportunity for professionals to learn more about how to teach the rider. Subjects such as balance, the seat, moving with the horse, straightening a crooked rider etc are often overlooked in horse focused lessons. Soon participants realise the horse is guided by what the rider does rightly or wrongly. Improving the Riders Technique can only improve the way the horse moves. Instructors learn where to start. They learn to diagnose and address problems. They learn how to communicate the feel to a rider to fascilitate learning. Instructor Training clinics are to produce better instructors. Instructors who recognise the roll of the rider and can improve the riders effectiveness to correctly influence the horse. Any qualified instructor who is keen to work from a broader base. Instructor training clinics range from one day Masterclass format for large numbers to 4 day Hands on Intensive training for groups of around 8 -10. A typical Intensive would involve theory, teaching and problem solving demonstrations and supervised practise sessions with guinee pig riders. - A suitable well lit private indoor arena with a good low dust working surface. Judge Training is to hone the judges skill. Judging requires quick and accurate assessment of the rider so a constructive score from one to ten can be given. Judges don't need to know the process of training but they do need to know how a rider should sit and how connumication with the horse happens. They need to be able to reward a skilled rider getting the best form a less talented horse more than a less skilled rider on a very good moving horse. In a Judge Training judges also learn how to give constructive advice relating to the score given and how to assess the seriousness of a rider fault. To educate judges in the subject of the seat of the rider and it's influence on the horse so that appropriate scores and appropriate comments can be given. Judges are, after all, the guardians of the sport of Dressage. Any judge who takes their responsibilities to the riders and the future of the sport seriously. Judge Training takes the form of a one or two day seminar. The days starts with a lecture and progresses to assessing guinea pig riders through a wide variety of movements. - A well lit indoor arena with comfortable seating. Around 10 guinea pig riders of all levels. - A radio lapel microphone.